The Tarok is one of the largest MQB-based VW vehicles designed to date. For the second time in as many years, Volkswagen will display a concept unibody lifestyle pickup at the New York auto show specifically aimed at measuring consumer reaction to a bedded vehicle from the German brand. The Tarok concept unibody pickup was first shown last year in Brazil and a version is expected to go into production in South America in coming years. There are no plans now to import a version of the Tarok to the United States, where it would be subject to a 25 percent tariff. Volkswagen dealers in the U.S. say that a pickup is one of the main products missing from the brand's lineup. 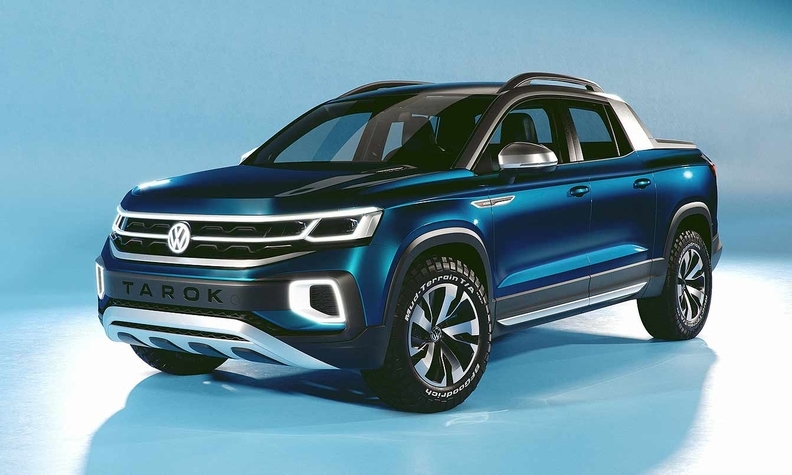 Built on Volkswagen's versatile MQB platform, which also undergirds the Atlas crossover, the Tarok concept is just under 5 inches shorter than the three-row Atlas at 193.5 inches. However, a folding rear wall in the cab allows the Tarok's 4-foot rear bed to extend another 26 inches. Drop the tailgate, and the Tarok's load bed can extend to over 8 feet long. Volkswagen says the Tarok's rear seat folds forward and the cabin interior can be sealed against moisture when the rear cabin wall is folded down. The truck, powered by a turbocharged 1.4-liter, 147-hp I-4 engine mated to a six-speed automatic transmission, has full-time all-wheel drive with a rotary knob in the center console that allows the driver to vary the pickup's performance based on terrain. Inside the cabin, the South American concept pickup features a 9.2-inch touch screen infotainment system and Volkswagen's configurable digital cockpit instrument cluster. At the 2018 New York auto show, Volkswagen showed an Atlas-based unibody concept lifestyle pickup it called the Tanoak, which featured a sliding bar that allowed a user to more easily carry roof-mounted accessories, such as kayaks.